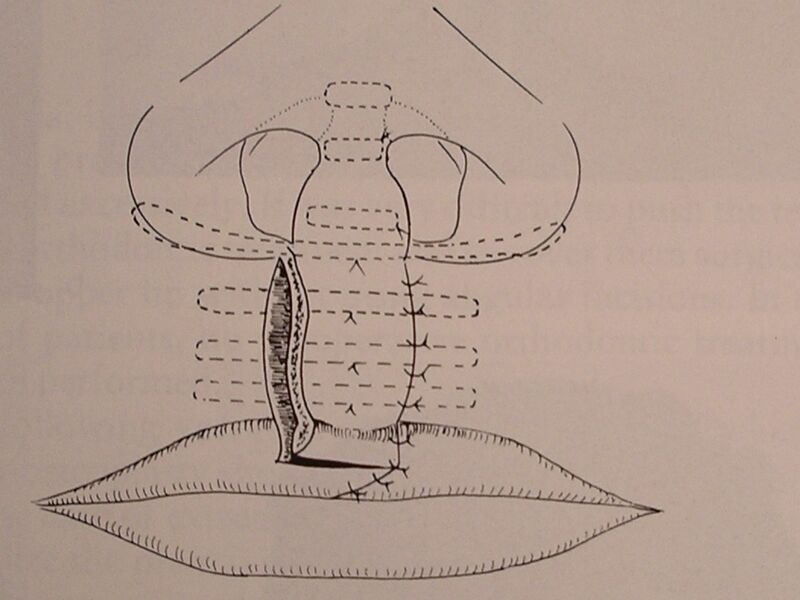 An universal technique for primary closure and revision of all types of cleft lips. 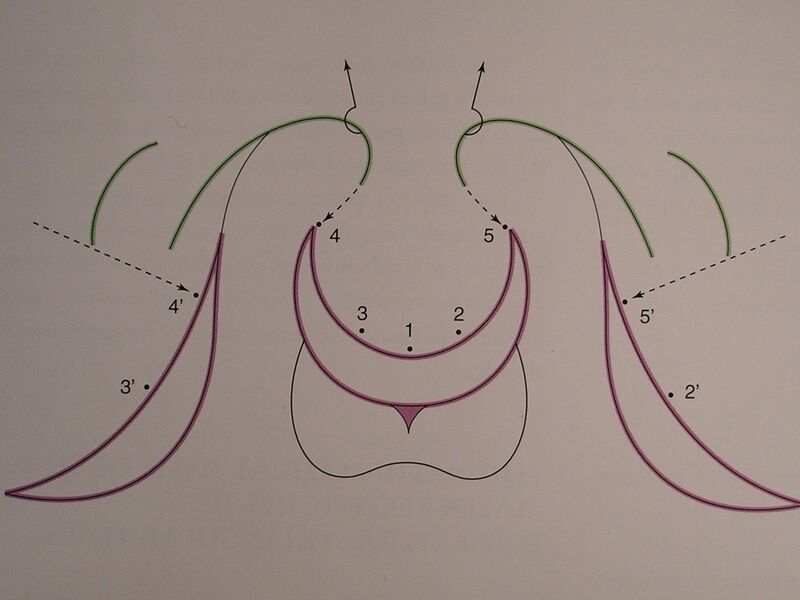 In Germany and Austria the Wave Line Incision Method, developed by Prof. Dr. Dr. Gerhard Pfeifer in the 1960s, Director of the Maxillofacial Surgery Department of the University of Hamburg/Germany (died in 2003) is a widely performed procedure for the closure of cleft lips, whereas it is hardly exercised in the Anglo-American countries due to a lack of corresponding publications in the English speaking literature. With this method, which avoids incisions crossing the philtrum, aesthetic and functional short and long term results are acquired. It is applicable for all types of cleft lips. The variability of the incision results in an arbitrarily gain in form and function of the lip, which makes it an unrivalled procedure. This is a great benefit in the treatment of patients who have had various previous operations with a less than satisfactory outcome, as we often see in our camps. When performed in combination with a reconstruction of the peri-oral and peri-nasal muscle slings, as claimed by Prof. Delaire (Nantes/France), an undisturbed development of the soft tissues and the underlying bone and cartilage can be expected. Since 1992, the author has applied this operation on about 450 patients with cleft lips, most of whom he has personally followed up in his cleft lip clinic. This universally applicable method is easy to learn and to teach. This has been thoroughly proven on assignments with Interplast-Germany and in the operation theatre of the author. The experienced cleft lip surgeon will find several well-known steps in the following description, as they are commonly used in other procedures. Once the surgeon sees a sample surgery, it will quickly clarify how universally applicable this method really is. The lesser experienced surgeon will most likely need to sketch the incision lines and assist in these operations several times until he or she gains full skill and responsibility. However one should always remember that in cleft lip surgery, the imminent result does not distinguish the surgeon, but the long-term outcome, after termination of facial and bone development truly distinguishes the surgeon. In the hands of an experienced surgeon, who frequently operates on patients with cleft lips and who is able to oversee his long-term outcomes, excellent results can be achieved with any method of his choice. In the 1960s Professor Pfeifer was senior consultant with Prof Schuchardt, head of the Department of Maxillofacial surgery in the University Hospital of Hamburg-Eppendorf. After Prof Schuchardt retired, Professor Pfeifer succeeded in his position as head of department from the 1970s until his own retirement. Besides being involved in scientific work concerning all aspects of the development of the different types of cleft lips, in his clinic he was confronted with a vast number of primary and secondary repairs of patients who had been operated for cleft lips during the time of suboptimal conditions after the World War II. 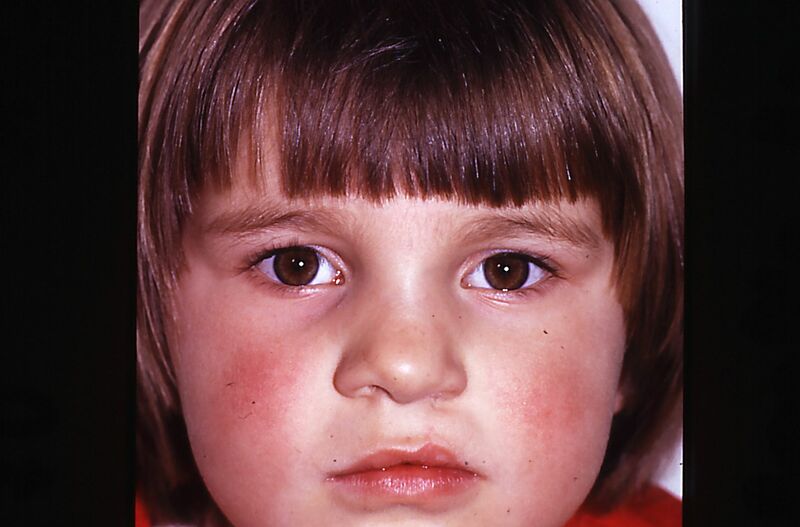 In these patients, scar tissue often had to be excised, a narrowing of the upper lip had to be corrected, and falsely adapted orbicularis oris muscles had to be rejoined in an anatomically correct way. These findings can be compared to those we see regularly during our INTERPLAST camps. With the use of the wave line incision of the lip in combination with a correct realignment of the underlying muscle ring, a full corrective treatment was achieved in most of these patients. 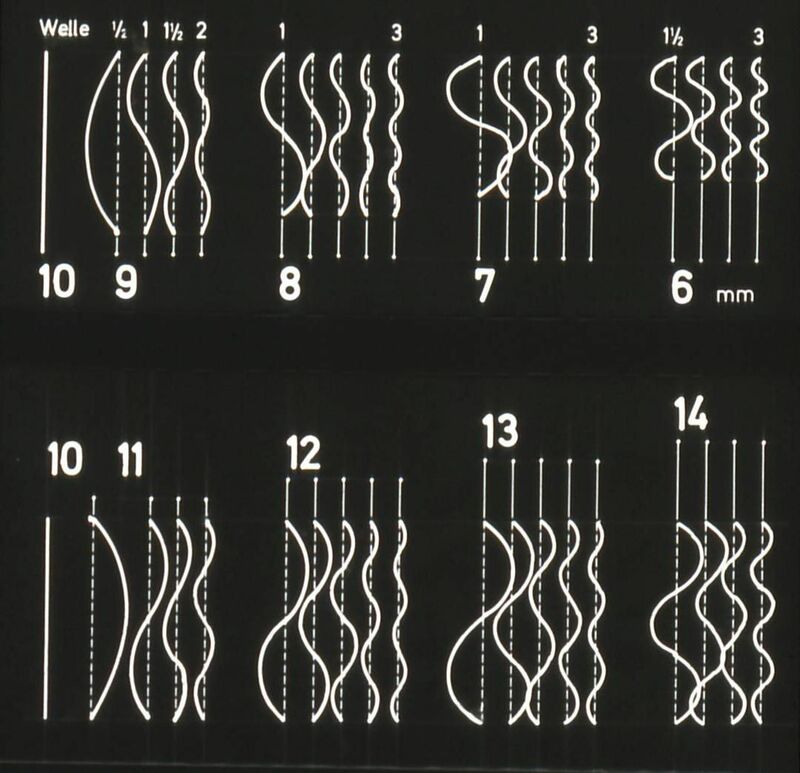 In fact, the wave line incision is also mentioned in Millard’s publication “Cleft Craft”. 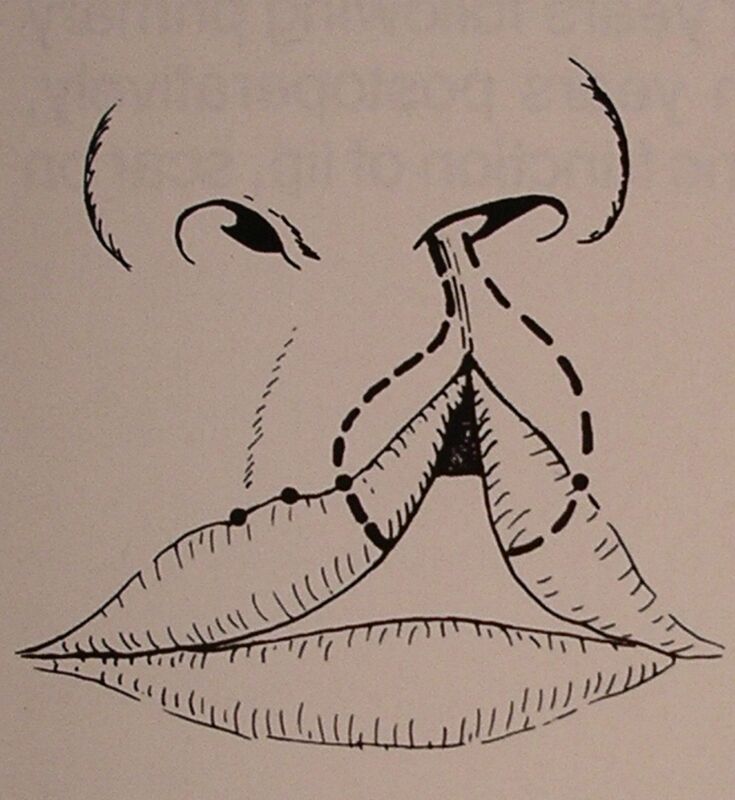 Pfeifer first tried to use this technique for the primary closure of cleft lips during his time as head of the Department of Maxillofacial Surgery at theUniversityofTuebingen,Germany. During that time, he operated with Professor Steinhilber on all of his cleft patients using the wave line technique, which he developed from 1967 until 1970. He utilised photographic & model documentation of the different steps of planning and executing the operation and of the follow-ups. These are still available from the author. The author was able to gather ample information about his methodical approach from his senior colleague Prof. Steinhilber, who had operated a vast amount of patients next to Prof. Pfeifer. All operation techniques aim at the adjustment of the length of the lip stumps to reconstruct the lip height according to the un-clefted normal side, a symmetrical nasal opening, and a harmonic cupid bow. As a rule, this can be achieved by a flap exchange between both lip stumps. Using this method, a scar crossing the philtrum edge is often avoided. This is in contrast to other methods like the techniques of Hagedorn, Tennison-Randall, LeMesurier, and Millard. Additionally, the additional philtrum length is acquired by arched skin incisions: while stretching the wave caudally, a straight incision line is formed according to the philtrum length of the other side. The required different surplus of length of the medial and lateral stumps will be accomplished by a variable height of the waves and the amount of arches. This can be seen in Pfeifer’s original illustration (Fig. 1). 1. Marking points characteristic for a cleft lip are sketched on the patient. Subsequently, the hiltrum height of the non-clefted side is measured (Distance 3 to 4, Fig. 2). A soft wire is cut to this length and later bent into a wave that fits between points 2 and 5 on the medial side and points 2′ and 5′ on the lateral side. The last bow emerging onto the vermillion border has to hit it in a 90 degrees angle. Keep in mind that many little waves form a big gain in height, and little or one big wave will result in very little gain in height (Fig. 3). Practical experience shows that the simplest version with the least number of waves is usually the best. 2. The waves converge dorsally into the nostrils in incomplete clefts. 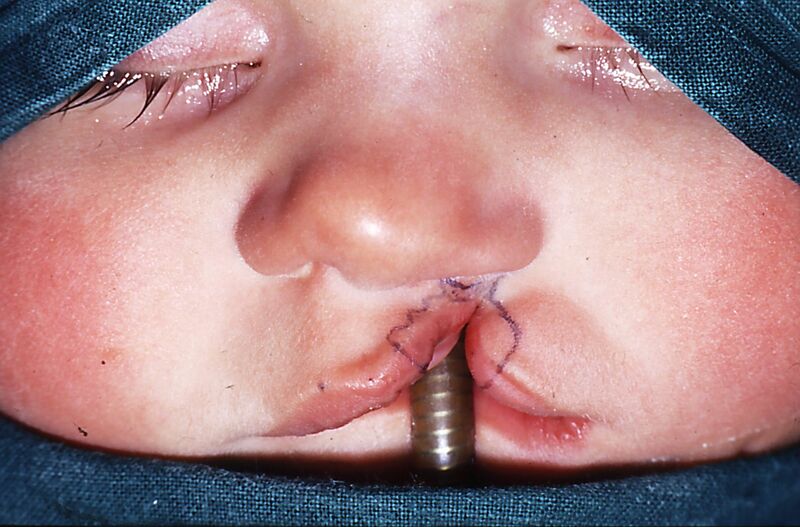 In complete cleft lips, the incision line on the medial stump is directed towards the lower edge of the vomer. It ends behind the suture between the vomer and the maxillary bone. On the lateral cleft side, the incision line ends below the anterior end of the lower concha along the border between the oral and the nasal mucosa. 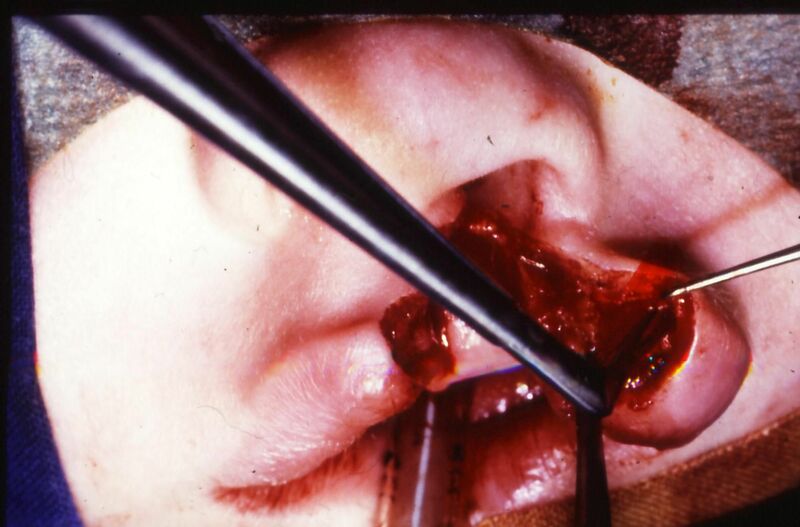 By doing this on the medial side of the cleft, a mucoperiostal flap is mobilized cranially based on the vomer and on the lateral side another cranially based mucoperiostal flap is mobilized from the lateral side of the nasal wall. This allows for the reconstruction of a tension-free nasal floor. 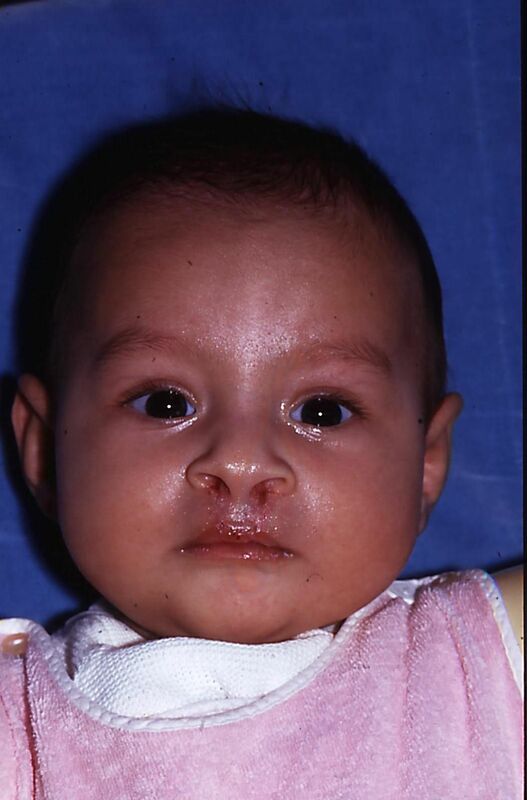 A hyperplastic lower concha is common in cleft lip patients. This can be resected with scissors. Cauterization of the wound edges is advisable, as they tend to bleed. 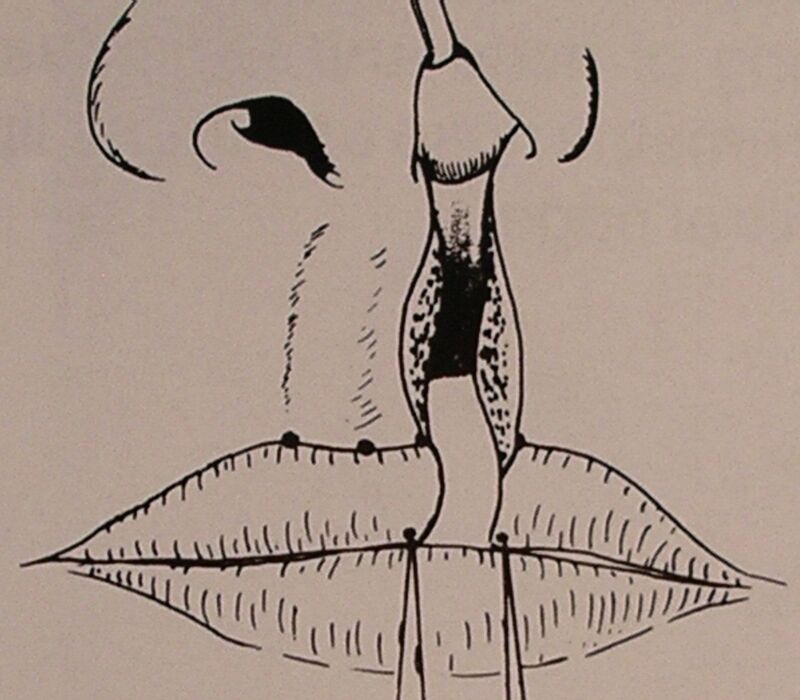 mucosa of the vestibule of the upper lip. 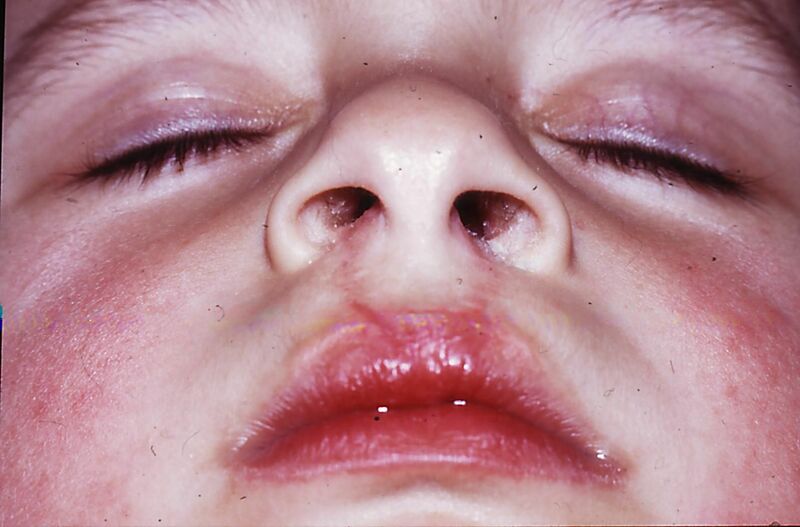 In complete clefts, the incision line of skin and mucosa of each side of the cleft converge dorsally into the nostril. Behind this point, a mucoperiostal incision is made on the border between vestibular and palatine mucosa, perpendicular to the alveolar bone. If teeth are adjacent to the clefted alveolar process, this incision can verge into the gingival sulcus of the teeth. By performing this in complete clefts, three mucoperiostal flaps can be formed on each side. A fusion of these three flaps will form a periost lined and hematoma-filled tunnel between the jaw stumps which theoretically induces a spontaneous growth of bone into the alveolar cleft (so called periostoplasty after Skoog and Millard). In certain cases, this spontaneous bone growth was noted by the author. In any case, a stable multilayered nostril and nasal floor with appropriate vestibular depth is achieved in most cases. 4. 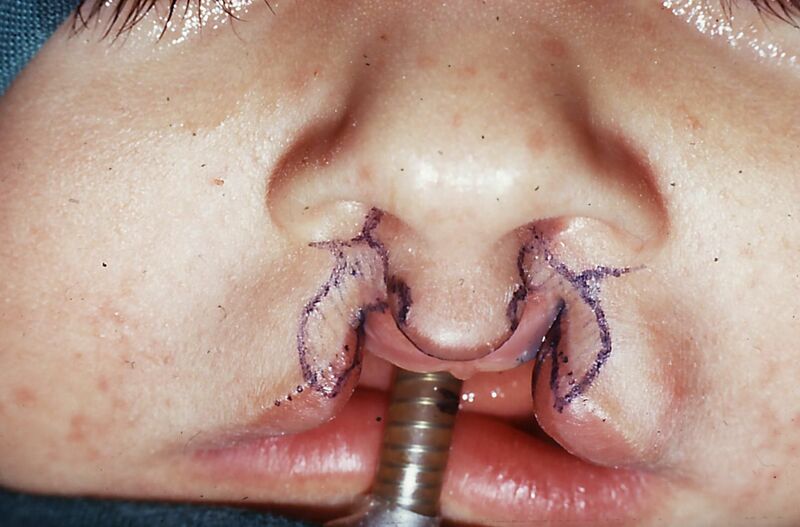 If a complete closure of the cleft lip and cleft palate is intended in one setting, the incision is continued backwards on the lower edge of the vomer on the medial side and on the lateral side below the lower nasal concha, approximately 1 mm palatine to the transition between nasal to oral mucosa. The incisions are continued on both sides into the soft palate up to the tip of the clefted uvula. By doing this the oral and nasal mucosal sheets of the entire palate can be mobilised and used for a tension-free closure. 5. Once the incision has been marked on the skin and mucosa, the soft tissue adjacent to the cleft is infiltrated with a local anaesthetic solution. The author uses 2% lidocaine with 1:100.00 or 1:200.00 epinephrine. 6. Wait! The epinephrine requires 10 minutes to reach optimal vasoconstriction. 7. With a scalpel size No. 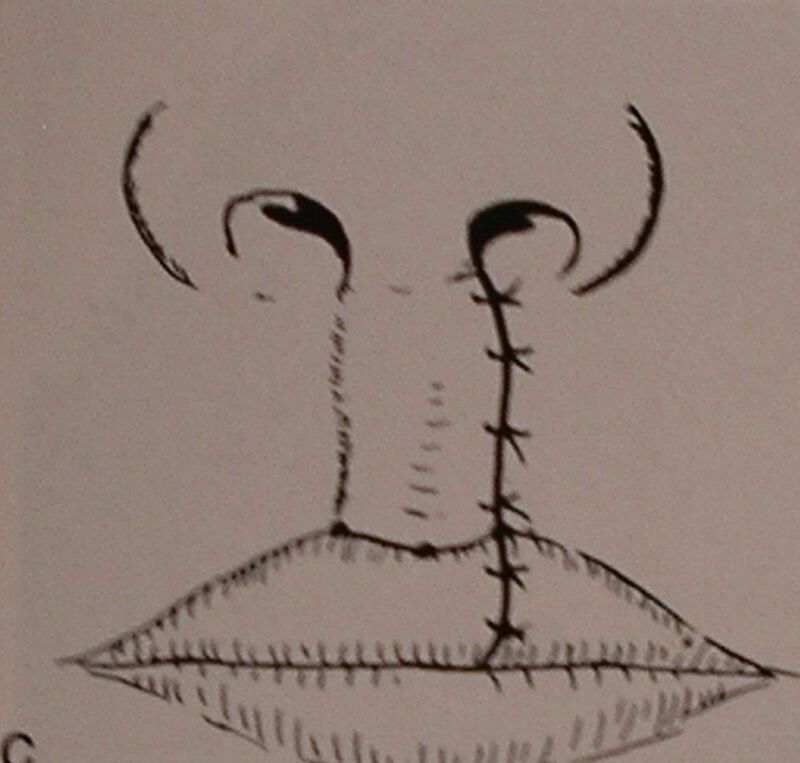 11, the incision is made using digital compression of the upper lip skin and subcutaneous tissue (leave the tattooed markings outside the incision line for reference). The vermillion border always has to be incised at a right angle. The incision is continued several millimeters straight into the mucosa. Then the mucosal incision turns 90 degrees backwards and follows the vermillion border into the nasal entrance converging to the wave lined skin incision. Both incisions join inside the nasal entrance. At this point, on the medial side the tip of the scalpel sits on the bone of the anterior nasal spine. On the lateral side it sits on the piriform aperture. To create a mucoperiostal flap, the knife is now used to cut backwards with constant contact to bone, medial onto the lower edge of the vomer, lateral below the nasal concha. The tissue of the lip that lies between the skin and mucosa of the cleft is completely excised and discarded. Very careful use of electrocautery is absolutely required, as it can form a scar in the muscle which may cause functional deficits in babies and infants. 8. The orbicularis muscle is now separated carefully from the skin and the mucosa with sharp pointed scissors on both sides (Fig. 4). In the midline, this should not extend under the philtrum (2-3 mm in depth) to avoid a flattening of the philtrum. All false insertions of this muscle at the anterior nasal spine and at the medial crus of the ala, and laterally at the base of the lateral crus and the piriform aperture have to be taken down. (Fig. 5). 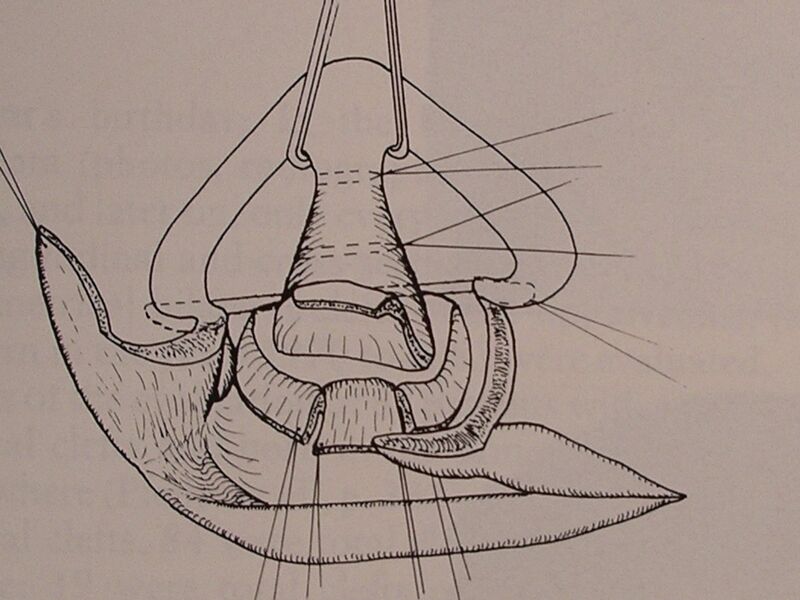 As described by Delaire, the periosteum is now taken down from the leading edge of the aperture together with the nasal mucosa. This creates mucoperiostal flaps, one caudally to form the palatine side of the nose and the other ventrally to form the mucosa that bridges the gap between the alveolar processes. While adjoining the paranasal muscles below the nasal entrance the laterally drawn ala rotates towards the midline. After all the cranial ‘false‘ insertions of the ring muscle have been released, further cranial and dorsal subperiostal muscle insertions should be taken down by an extensive dull subperiostal preparation along the anterior surface of the maxilla with blunt scissor dissection. This creates extensive mobilisation to allow the tension-free closure of even wide clefts, without requiring additional lateral relaxing mucosal incisions along the buccal sulcus (to perform a so called presuturing). 9. Now, a supporting suture has to be placed at the vermillion lip border, which has to be kept long without tying and fixed by a clamp. This can be stretched if required to show how the shape of the lip and the wave line is going to develop (Fig. 6). 10. Beginning on the dorsal end, the nasal mucosal flap is sewn with interrupted sutures (4.0 Vicryl, RB1 needle) up to the nasal opening. 11. The suture to position the ala, shaping of the nostril and the adapting of the paranasal muscles is placed. This suture catches the base of the lateral and medial ala cartilage with as much tissue as possible. Once tension is put on this suture, the ala rotates towards the midline in direction of the progressively vertical philtrum. The final result of the corrected side should be symmetrical to the non corrected nostril. To do this, it is not unusual to reposition the suture several times. The suture should be pulled tight until an optimal positioning of the ala is achieved. In general this results into a loose knot (Fig. 7). In contrary to the described method of Pfeifer (Fig. 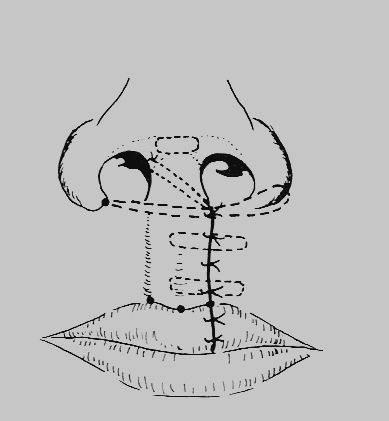 7), where the suture is positioned from the ala base of the cleft side to the ala base of the non-cleft side, this suture should only grasp the base of the medial crus of the ala and the cleft sided lateral crus of the ala, to avoid an alteration of the ala position on the non-cleft side. The mobilization and positioning of the ala can be made a lot easier by elevating the skin of the alar and triangular cartilage with dull preparation, starting from the lateral alar base proceeding from the side up to the dome of the nose and in the midline going up the columella. By doing this maneuver, a circular tunnel between skin and cartilage is formed which enables an easy rotation of skin and cartilage against each other. Incisions of the alar cartilage have to be avoided at all costs in infants and toddlers as they lead to growth inhibition. 12. Now, the two mucosal flaps which form the palate are joined with one or two sutures (knots everted into the oral cavity) below the previously reconstructed nasal floor. 13. The subsequent realignment of the orbicularis muscle is performed with three to four wide stitches starting at the vermillion border towards the nasal floor. To ensure an exact anatomical alignment of the muscle, the stay suture on the lip-red/white border might have to be repositioned again. 14. Now, the mucosa is closed, beginning at the vermillion border and proceeding inwards. While doing this, minor corrective incisions and excisions are often required. A tissue deficit sometimes has to be filled with mucosal rotation flaps. To prevent scars, a Z-plasty on the inside of the lip, established by Dr. Hubertus Tilkorn, has shown to be of special value. 16. For one day, a packing is placed in the nostril to avoid the formation of a cavity between skin and cartilage. Steri strips are also applied for a day. Both are removed the next day and the lip is cleaned thoroughly with 3% peroxide solution and Q-tips. Then, antibacterial ointment is applied. The wave line incision method is also suitable for all types of bilateral clefts. The positioning of the symmetric marking points is equivalent to the common approaches as described above. The width of the philtrum has to be adapted to the physiognomy of the population. On the lower edge of the philtrum an approximately 2mm border of lip mucosa is preserved. This border has to be excised accordingly on the lateral lip stumps. 1. After positioning of the typical marking points (Fig. 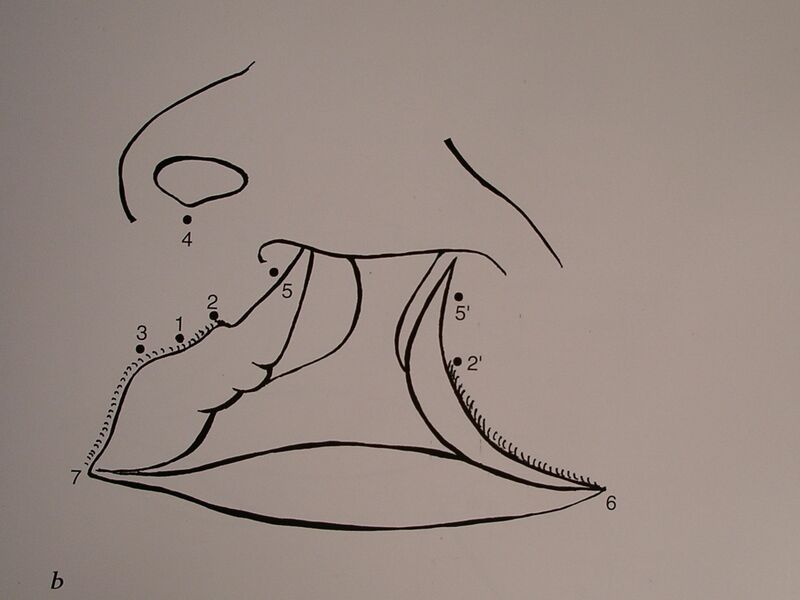 9), the wave line is sketched on the skin and mucosa on the lateral lip stumps according to the above described procedure for unilateral clefts. Special attention has to be paid to acquire a symmetry of both sides. Furthermore, a piece of vermillion border has to be excised on each side, which equates half the width of the determined width of the philtrum. Here the left vermillion border is embedded later on (Fig. 10). 2. Because in the area of the shortened and cranial rotated philtrum a large gain of length is required, multiple short waves are sketched in. Note that the wave lines should have the maximum distance to each other at the level of the nostrils. This is the only way to ensure a cranial elongation of the philtrum and the columella during the skin closure and within the subsequent growth, without requiring another operation (for example a fork plasty to elongate the columella as had been described by Millard. “The length of the columella is within the philtrum”). The author could avoid an elongation of the columella with most of his patients. Dorsally to the intermaxillary bone, the incision line ends on the lower edge of the vomer. 3. The injection of the local anaesthetic solution follows. 4. At first the skin and subcutaneous tissue are incised with a scalpel size No. 11 according to the previously outlined incision lines ( Fig. 11). The subcutaneous tissue of the philtrum is dissected and raised strictly in the subperiostal layer up to the base of the nasal septum. In complete bilateral clefts the philtrum is always free of muscle fibers. Below the elevated skin and subcutaneous layer the bilaterally mobilized stumps of the orbicularis oris muscle are joined in the midline. Dorsal to the nostrils in the area of the vomer mucosa the periosteum is divided and elevated from the vomer cranially, in order to build mucosal periosteum flaps for the reconstruction of the nasal floor. The mucosa of the philtrum is dissected caudally and preserved to use later or to be resected at the time of the closure of the oral mucosa. At the lateral aspect of the intermaxillary bone the mucosa is used to form the oral / palatinal sheet of the nasal floor together with the lateral side of the jaw stump mobilized mucoperiostal flap. The mucosa of the middle part of the philtrum is partially used to build the vestibule of the maxillary bone. Parts of it will have to be excised later on during the mucosal suture (primarily all tissue should be preserved!) (Fig. 12). 5. Now the muscle stumps are mobilized to the lateral side and freed from their false insertions to an extent that they can be joined over the maxillary bone (at times this is only possible under tension). At this point the subperiostal mobilization of facial tissue above the maxillary bone in direction of the cheek has to be repeatedly deepened to reduce tension. 6. The mucoperiosteal flaps of the lateral jaw stumps are mobilized as described in the unilateral cleft lip procedure. 7. The skin is bluntly mobilized from the alar base up to the nasal dome and loosened from the cartilage frame. 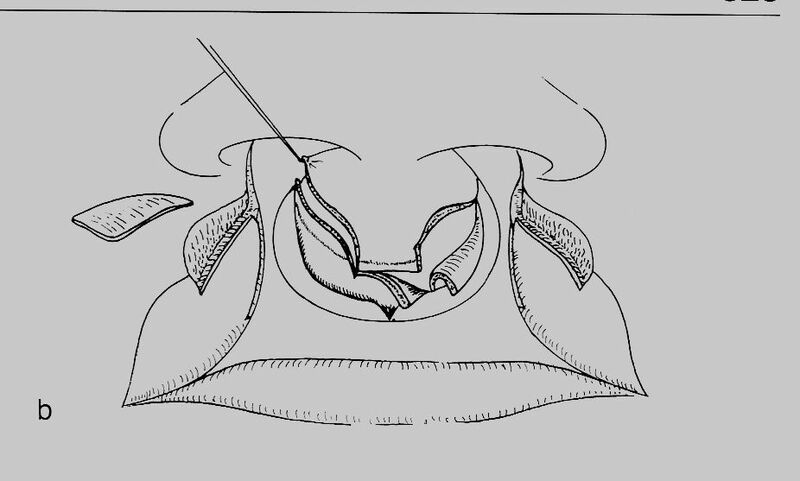 In the columella, strands of connective tissue between the crura medialia of both sides have to be dissected in order to enable the erection of the nasal dome. A suture placed high up in the nasal dome percutaneously (4.0 Vicryl) advances the crura medialia. By doing this the tip of the nose will be erected and the columella will be elongated. 8. The skin closure begins with the nasal mucosa up to the nostrils with 4.0 Vicryl. 9. A 4.0 Vicryl suture is placed through the base of both nostrils and the paranasal muscles. Slowly, tension is put on this suture. This maneuver advances the nasal alae and forms the nostrils symmetrically. This suture is loosely tied in front of the maxillary bone until the desired position of both alae is achieved. If a kinking of the alae occurs, the suture has to be loosened and further mobilisation of the skin off the cartilage frame of the nose has to be performed to minimize this kinking(skin and cartilage should be able to be rotated freely against each other). Placing of this suture can be laborious at times but already allows a preview of the expected lip and nasal shape. 10. Now a holding stitch is placed between both stumps at the vermilion border. This suture is grasped with a clamp in the midline and pulled caudally. By doing this, the muscles of both sides join over the periosteum of the maxillary bone in the expected anatomical manner. 11. The muscle bundles are joined over the protruding maxillary bone with three to four widely spread 4.0 Vicryl sutures from the vermilion border to the nasal entrance. Often this is not possible without a bit of tension. It is remarkable how fast the maxillary bone moves backwards with the dorsocaudally directed pull of the reconstructed orbicularis oris muscle and coincidentally elongates the seemingly short philtrum and the columella. “Form follows function” is an ubiquitous treatment principle in the maxillofacial practice. With the constant impact of small forces the position of teeth and the form of the jaw are remodelled. 12. With a small Langenbeck retractor the upper lip is everted. The following step requires some skill. 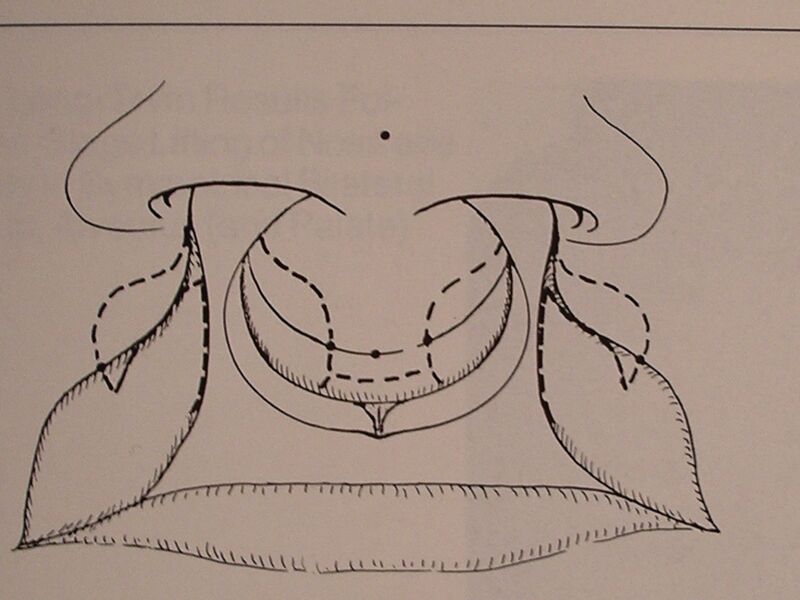 Then, in the middle of the philtrum, abundant and lateral to it, scarce amount of mucosa has to be partially excised and partially elongated with a Z-plasty or with a horizontal incision in the buccal sulcus in order to create a tension free alignment and to create a high vestibule over the maxillary bone. Only this secures a good mobility of the upper lip with normal function and an undisturbed dentition. The suture material is 4.0 or 5.0 Vicryl. 13. Subsequently, the philtrum which has been elevated cranially with a holding stitch is embedded in the midline defect of the upper lip and fixed subcutaneously with 5-0 Vicryl on a TF1 needle while stretching the narrow waves to an almost straight line. 14. Now, under observation of the vermillion border the skin suture with 6.0 fast-absorbing gut is placed (Fig. 13). Directly on the bulge of the nostrils a 5.0 Vicryl suture can be placed so that manipulation by the patient does not loosen the other skin stitches. Due to the slow absorption of the sutures the punctures are a bit visible but not eye catching. 15. To avoid a dead space between the nasal cartilage and the mobilized skin above, packings are placed in each nostril. These are removed together with the Steri strips on the second postoperative day. At that time the wound is cleaned with hydrogen peroxide and Q-tips. The author sees the benefits of this method in the fact that it is a universally applicable method for the primary closure of all kinds of cleft lips. Minor planning errors and mistakes of measurement can be corrected at any stage by shifting waves into the nostril or stretching them out of the nostril while the skin is closed. The method also fulfils Delaire’s requirement of ideal functional reconstruction of the perioral and perinasal muscle slings. In addition, scars crossing the philtrum edge can be avoided. It is also a method which in its simplicity is easy to learn and easy to teach. A negative aspect is the temporary postoperative shortening of the lip scar, which spontaneously improves within a few months by the regained function of the muscles of the lip (patient’s parents have to be informed about this fact). Another disadvantage is that due to small numbers of English speaking publications this method is hardly circulated internationally. I dedicate this presentation to my deceased and highly honoured mentor, teacher and friend Professor Dr. Wolfgang Steinhilber. 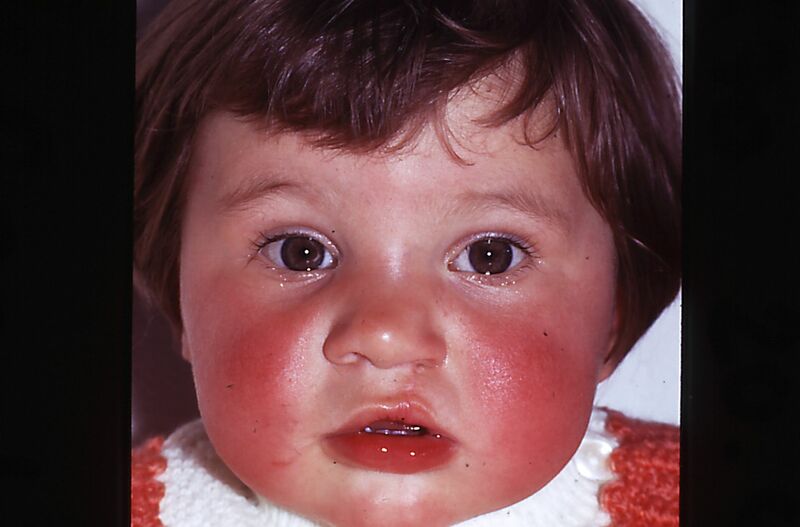 The time consuming translation of this article into medical English was performed by Dr. Cordula Tilkorn, Wellington, New Zealand, and revised by Dr. Ruben Cohen, New York, USA. Thank you very much.